In order to have an easy way to manage all the payment options for your store PrestaShop 1.6 provides you with a dedicated page where the applications makes this possible. In order to access that page you will need to login into the Back Office of your store and to navigate to Modules>Payment. 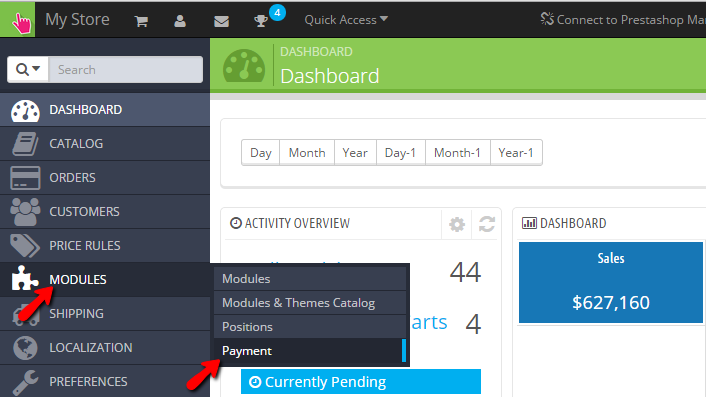 Once the Payment page is opened you will be able to see all of the currently activated payment methods and respectively to configure those further which we will review in the next step of this tutorial. At the top of the Payment page you will see a list of the “Active Payment” methods. These are actual modules activated for your Store by default. Currently with PrestaShop 1.6 the default activated payment methods are Bank wire and of course Payment by check. In order to configure any of these payment methods you will need to simply click on the configure button. Once you do that you will be redirected to another page where you will be able to perform the required configuration related to the concrete payment method you have chosen. The alternative payment methods are nothing more than simply another payment method which is not activated nor configured with the default installation of PrestaShop 1.6. On the Payment page you will find these methods listed right below the already activated payment methods. In order to activate any of these payment methods simply click on the Install button and the payment method will be installed as separate module which afterwards you will be able to configure. Of course the configuration for every payment method is different, however quite intuitive and mostly you will need to contact the payment method provider in order to obtain critical information such as standard usernames, passwords, API keys and so on. If you are experiencing difficulties configuring certain payment method, our PrestaShop Hosting package includes dedicated support for such tasks so you will never feel alone in the dark. Congratulations! You can now fully manage the payment methods provided by your Store!